Scott Christensen (Stillwater HS - MN) simplifies proven scientific theory and case study evidence to show you how to progress 800m training design for optimal results. Instead, download Scott’s FREE guide that goes beyond mileage and interval workouts to prepare your middle distance runners for racing. Oh, and it’s free! Don't fall behind the times when it comes to planning training for your 800m runners. 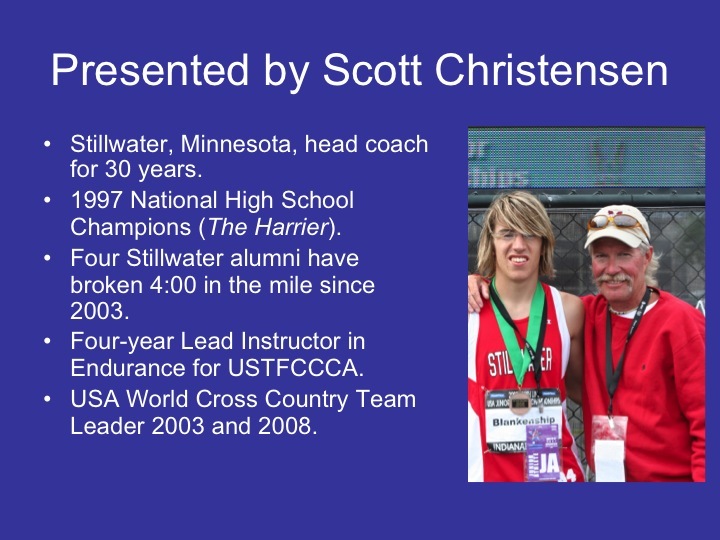 Stillwater HS (Minnesota) head coach for 30 years and 14 year USATF Level 2 Lead Endurance Instructor. Four Stillwater alumni have broken 4:00 in the mile since 2003. USA World Cross Country Team Leader in 2003 and 2008. ...then watch, stream and/or download Scott Christensen's 66+ minute '800m: Successful Coaching Strategies' right now for only $37. Stream your video on any device with Internet access…or download the files to your hard drive for offline viewing. Don’t pay more for resources that leave you to fend for yourself after purchase when Coach Christensen will answer all of your training questions.